Dutch Prime Minister Mark Rutte looks set for a return to office after his pro-EU austerity VVD party became the biggest winner in this weekâ€™s general election, closely followed by the Labour Party. With the Socialist Party coming third at some distance, the elections turned out to be a two-horse race. 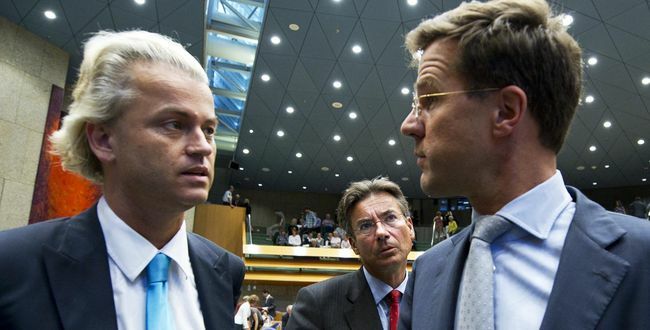 The most positive outcome was the heavy defeat suffered by the far right PVV (Party for Freedom), led by Islam-bashing neo-crusader Geert Wilders, which lost 9 out of their 24 seats in the 150-seat parliament. 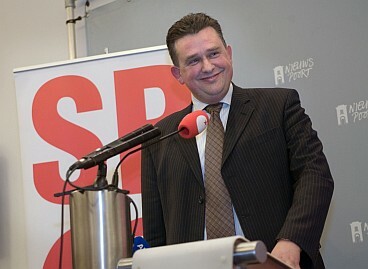 Polls in recent weeks had suggested a swing to the left, with the Socialist Party (SP) led by Emile Roemer, almost becoming the biggest party in the polls. Since then, much has been made of the influence of numerous US-style televised debates, in which Labour leader Diederik Samson performed well. Labourâ€˜s subsequent surge in popularity over the last two weeks meant that with election day looming, the media increasingly portrayed the elections as a clash between the centre-right VVD (which stands for People’s Party for Freedom and Democracy) and centre-left Labour. This is widely understood to have led to strategic voting, with PVV voters playing safe by voting VVD and Socialist Party-backers voting Labour in the hope for a left-wing prime minister. The only likely government now seems to be a Liberal-Labour â€˜Purpleâ€™ coalition, which would mean a return to the 1994 â€“ 2002 years when the two biggest parties joined forces with the smaller centrist party D66. The Dutch electoral landscape is characterised by a genuinely multi-party system, the product of decades of â€˜pillarisationâ€™ and a perpetual group of swing voters, in this election estimated to be a staggering 40 per cent. Aside from the VVD and Labour, nine other parties made it into parliament, but none of these has more than 10 per cent of the seats. New parties include the Pirate Party, which is against internet surveillance and state regulation of digital information and 50Plus, which is committed to defending pensions, health care rights of the elderly and their position on the labour market. 50Plus won two seats in the new parliament. The Dutch Labour Party has, much like it British counterpart, strayed away from its working class base and during the 1990â€™s increasingly embraced neoliberalism, so to say this is a victory for the centre-ground is really to accept the logic of neoliberalism. Pro-European parties won 110 of the 150 seats, so the result should be understood as a vote for Europe. The question is, however, whether the new government will embrace Merkelâ€™s austerity politics â€“ a major point of disagreement between Labour and the VVD. Finally, both parties are united in their servitude to Washington and agree on continuing the Dutch mission in Afghanistan. The VVD, in foreign media described as the Liberals, gained 41 seats (out of 150) on the basis of a programme that can only be described as thoroughly right wing. One of their slogans reads: â€˜Compassion for victims, no compassion for criminals.â€™ Other aspects of the programme outlined a commitment to austerity, increasing private provision within the healthcare system, lowering taxes, more police on Dutch streets, an end to mass immigration and a strengthening of Fortress Europe. According to one Dutch columnist: â€œLiberalism in the VVD has been reduced to the right to race around in your car undisturbed, smoke undisturbed and bash in the heads of burglars undisturbed.â€ The same article also notes the cosy relationship prime minister Rutte enjoyed with ex-coalition partner Geert Wilders, the latter being a firm opponent of some fundamental tenets of liberalism, most notably the one relating to freedom of religion. Over the last decade Holland has witnessed the rise and fall of several new far right political parties, most notably the populist one of the late Pim Fortuyn, who was assassinated by an animal rights activist in 2002. Fortuyn, an openly gay, popular right-wing intellectual, rose to prominence with his anti-Islam rhetoric and criticism of Hollandâ€™s multiculturalism. After his death, his party quickly disbanded as a result of internal strife. His ideological successor is Geert Wilders, but it seems that the latterâ€™s populist anti-Islam, anti-Europe rhetoric and relentless aggression, coupled with his abandoning of budget talks which led to the fall of the last cabinet, has pushed right wing voters back towards the more moderate VVD. Dutch newspapers hailed the victory of the centrist parties as an end to political polarisation and a mark of renewed confidence in the political centre. But Holland remains deeply divided over Europe, immigration and the economy. Furthermore Dutch migrant communities â€“ most notably from Morocco, Turkey and the Caribbean â€“ remain thoroughly under-represented within the Dutch political establishment. Polls suggested that most ethnic minority voters (expected turnout is 45 percent, as opposed to 74 per cent of white voters) would vote socialist this time, a move away from Labour, traditionally the choice of preference for Dutch minority ethnic voters. The Socialist Party, however, remains silent in their manifesto on the Dutch climate of islamophobia, and their statement on â€˜discriminationâ€™ (the word racism does not feature in their programme) is based on the kind of generic language you usually find in a corporate mission statement. This is baffling considering the fact that PVV, an outright racist party, became the third biggest party in the general election of 2010. On the other hand, it is an indictment of the disconnect between the SP and Dutch migrant communities, as well as the fact that electoral politics force political parties to keep quiet on issues that would alienate white voters. The SP are in many ways a left wing alternative to the PVV, and they know this very well. It is important to note that there is no overarching identity in Holland which encompasses a multi-ethnic â€˜Dutchnessâ€™, in the way ethnic minorities in the UK identify as â€˜Britishâ€™. Non-white Dutch citizens, whether they are first or third generation immigrants are grouped under the banner of â€˜Allochtoonâ€™ (meaning originating from another country). Â Dutch writer Egbert Martina puts it the following way: â€œThe Netherlands is still caught up in a nation-state identity construction that is a material â€“ and territorial, homogeneous, bounded â€“ conception of identity. Multi-ethnic (national?) national identities are not seen as an option.â€ In the run-up to the election Wilders shifted his focus away from Muslim-bashing to stirring populist anti-EU sentiments among the general public. His general strategy seems to have failed, but islamophobia continues to be an effective tool within the Dutch political landscape and no political party has developed any real answer to it. The process of forging a new coalition will undoubtedly take several months and it seems that the Dutch are longing for a stable government, since the last minority coalition imploded after only a year and ten months in office. The new government will continue to be tough on immigration, and whether Labour will be willing and/or able to force through a U-turn on Merkel-style austerity remains to be seen. I, for one, am not holding my breath.